Earlier in the summer when we were almost home from a crazy 3 week road trip, we ended up in a small town lodged in the mountains of Washington state. We had just woken up from a bad night of camping due to rowdy neighbours at a state park and when we spotted a cool looking coffee shop a few miles down the road, it was exactly what we needed. Our americanos were amazing, but the coffee shop also had a small selection of in-house baked goods. 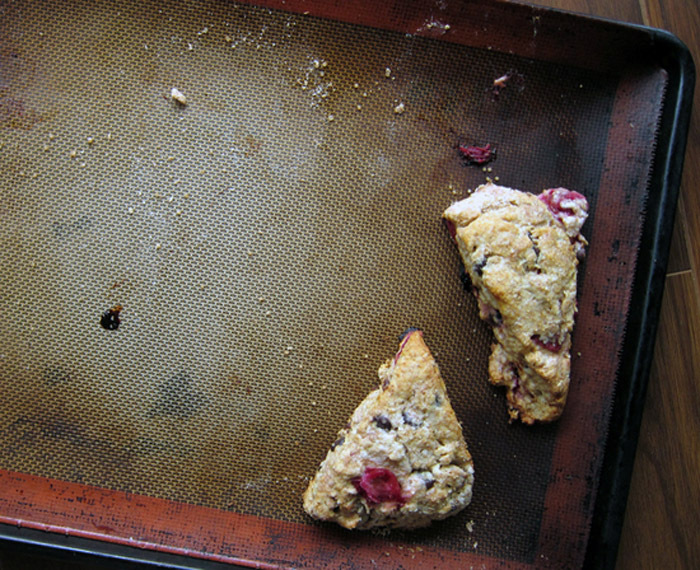 I grabbed the chocolate and raspberry scone, still warm from the oven, and bit in. That did it. It had been a while since I'd had a really good scone and the thought stuck with me until autumn came along and turning on the oven seemed justified. I had some frozen cherries on hand so I used those instead of raspberries - but raspberries, fresh or frozen, would work really well here. Using good chocolate is key. I had some fancy bittersweet chocolate chips that I used here, but you could certainly give a good bar of your favourite dark chocolate a rough chop and add it here for a more rustic bite. 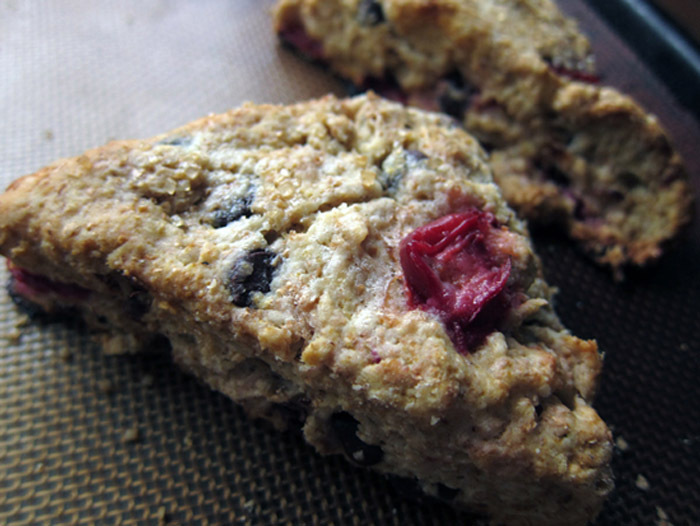 I used a mix of all-purpose flour and whole wheat and it gives these scones a hearty crunch and a bit of nuttiness. I think next time I'll try playing with spelt and almond flour for a gluten-free option. Preheat oven to 400F. Line baking sheet with parchment or silpat mat. In a large bowl, combine the first 5 ingredients and whisk them together. Work in the butter with your hands until the mixture resembles small peas. Add in the chocolate, cherries along with the milk and egg mixture, stirring with a wooden spoon until dough comes together. Sprinkle a clean work surface with a bit of flour and turn out the dough, kneading for no more than 12 times. Pat dough into a round shape, flattening it with your palms to 1/2 inch thick and cut into 8 wedges. Brush with a little cream and sprinkle on some raw sugar if you have any on hand. Bake for 12-15 minutes or until golden. Cool on a wire rack and eat warm or cold. 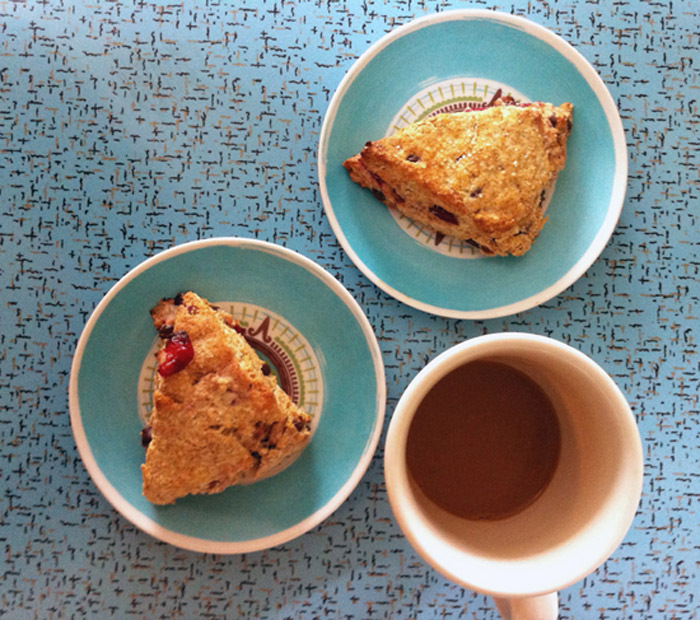 These scones definitely lived up to expectations. Chocolate, cherries and that little crunch of raw sugar sprinkled on top. Definitely coffee-shop memory worthy. Enjoy! yum! Those do sound and look delicious indeed! OH MY these look amazing!! And very fall-esque. I'll be trying these asap!! Great idea...perfect now that the weather has turned a bit cooler here, I will try this for sure. Yum! These look so good! Thanks for sharing! Yum and yum again! Would love to try this...but maybe with Pomegranetes?!!! this looks outrageously delicious, must give it a try!